From this point looking across the Parklands to the east approximately 600 metres you can see the old Victoria Park racecourse grandstand. 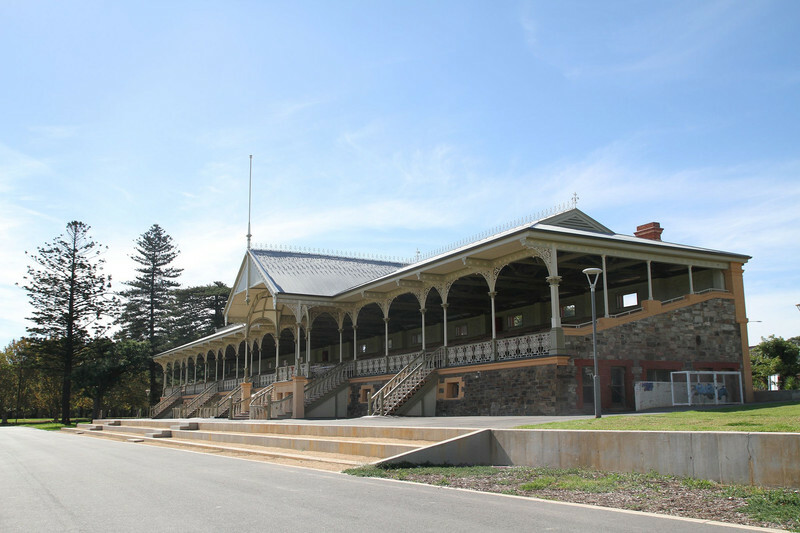 Although horse racing was conducted in the eastern parklands from the 1840s, this structure was built in the early 1880s at the same time as other public recreational spaces such as the Botanic Gardens and Zoological Gardens were taking shape. The old course was renamed Victoria Park in 1897 in honour of Queen Victoria’s Diamond Jubilee. 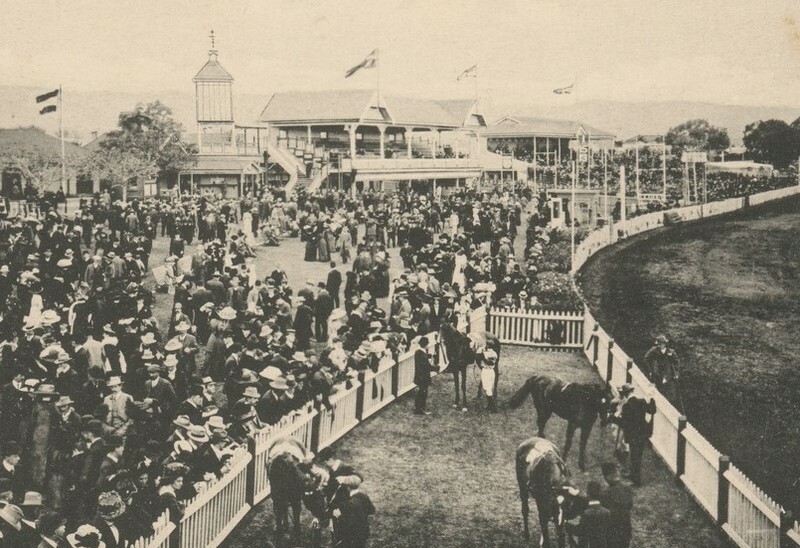 This grandstand was erected in response to the rivalry that then existed between the “old course” and the ‘new’ racecourse at Morphettville (present day home of horse racing in Adelaide). It also had to satisfy the agreement between the Adelaide Racing Club and the Adelaide City Council that the trustees of the club were bound to spend £2500 on the erection of a grandstand. In April 1882, architects Bayer and Withall for the Adelaide Racing Club provided plans for a grandstand in excess of £3000 in value. When constructed, the council reported that the lessees were to be congratulated for providing such an ornament to the east Park Lands. The structure still retains its ornamental function dominated by extensive use of cast-iron, the delicacy and intricacy of which contrasts well with the massive bluestone base. The stand, originally symmetrical about the gabled main entrance over the former trainers' box, was enlarged some time after World War I, and these extensions were carried out in total sympathy with the original section, using ironwork of identical design by Forwood, Down and Company, and A.C. Harley. The grandstand is an important example of the use of cast-iron in a non-domestic situation, its significance being enhanced by its association with the development of the “old course”. The design of the main entrance with complex double curved match boarding is distinctive, as are the staircases leading from ground level to the original seating above. 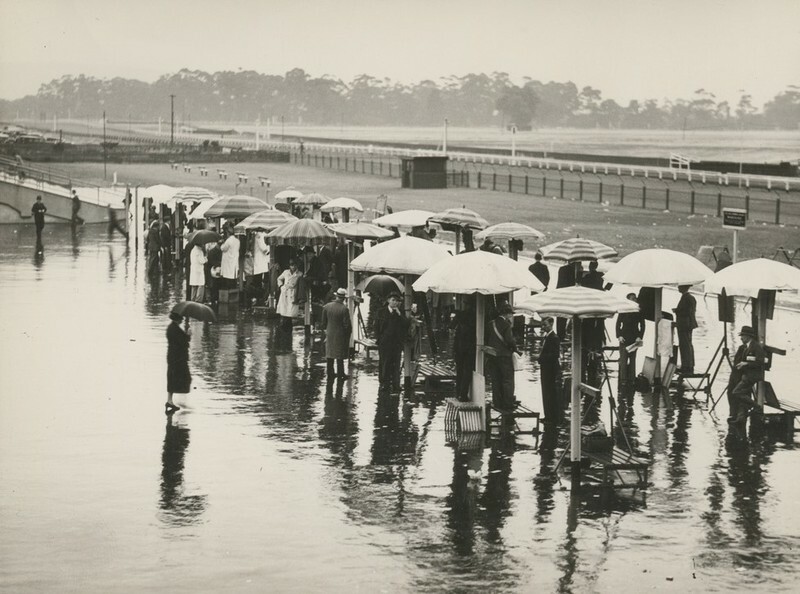 Victoria Park racecourse ceased operation in 2010 when all horseracing finally moved to Morphettville. Most of the other structures have now been dismantled. The refurbished grandstand remains as a reminder of more than 150 years of horse racing in the eastern Parklands. “Victoria Park - Pakapakanthi,” Adelaide City Explorer, accessed April 24, 2019, https://adelaidecityexplorer.com.au/items/show/214. ACA, Annual report 1912, p. 112, Digest of Proceedings, 30 January 1882, 24 April 1882, Historical photographs; Adelaide Racing Club, Victoria Park Adelaide, South Australia, The course of natural beauty; centenary, 1871-1971.